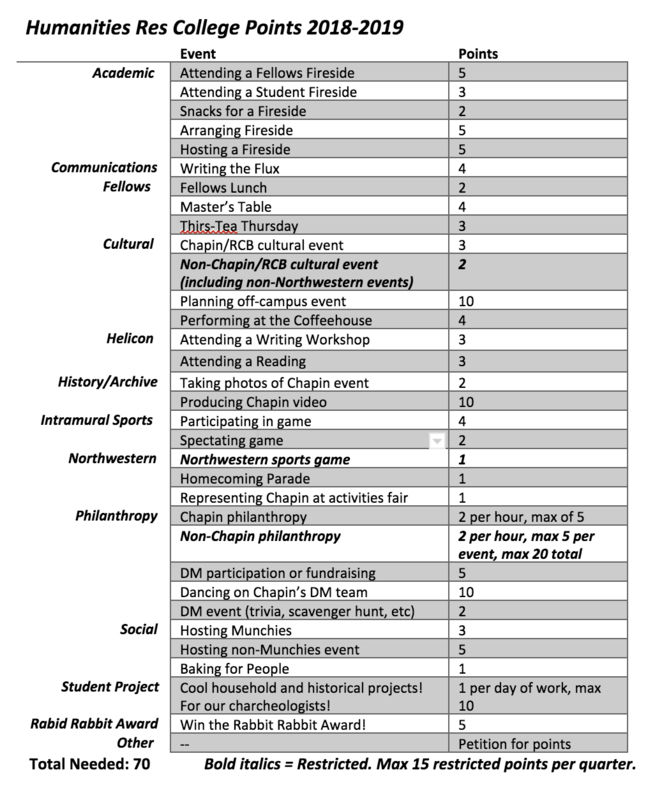 Points allow us to measure community involvement in Chapin and Northwestern at large. They are also important for room selection and availability for the next year! How many points do I need to live in Chapin again? You need a minimum of 70 points to live in Chapin next year, which is only 35 points a quarter. You can get points for many things, including participating in our intramural league, hosting munchies, or attending firesides! Refer to the chart below to see how many points can be earned for any given event. Is there a restriction on how many points I can earn? Nope! However, events that are Non-Chapin/RCB events can only count for 15 points per quarter. Everything else is unlimited. For more information on points, refer to the slideshow on this page.